Below are some frequently asked questions. If there is a question that we have not addressed please feel free to contact us. Can I install my new roof over top of my existing roof? Ben’s Roofing highly recommends that you tear off your existing roof prior to installing a new roof. The choice comes down to saving a little money now and risking greater expenses down the road, or spending more now to do the job right and minimize future expenses. Part of the reason we suggest a complete tear off is weight and its effect on the structure of your home. A shingle in your hand may not feel as though it weighs much, but cover a roof with 1,500 square feet of them, and it’s nearly the equivalent of parking a two-ton SUV up there! If you live in an area with high winds, keep in mind that shingles will hold better if fastened directly to the roof deck. In addition, removing the old shingles will allow you to inspect the roof deck or sheathing. The opportunity to evaluate the condition of your roof deck is valuable, insofar as you can check for wood rot at that time. By making any necessary repairs to sheathing you will avoid the very possible and dramatic losses caused when shingles blow off the roof, allowing rain to cause extensive interior damage. Overtop installs drastically decrease the life expectancy of a roofing system and are more prone to issues including wind damage, poor esthetics and leaks around detailed areas and flashings. Attic ventilation might seem like a minor consideration, but when properly installed, it can extend the life of your home's attics and roof structures—saving the homeowner hundreds of dollars in repair costs—and saving the roofing contractor from expensive, time-consuming callbacks. During warmer months, ventilation helps keep attics cool. It helps prevent hot, moist summer air from warping the roof sheathing. It also stops shingles from deteriorating prematurely. What’s more, fresh air in the attic makes a home much easier to cool, which can result in lower energy costs. In winter months, ventilation helps reduce moisture to keep attics dry. It stops water from backing up under shingles, damaging insulation, and rotting the roof structure itself. It also helps prevent ice dams from forming. 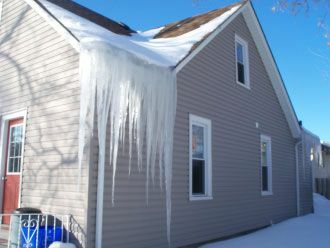 Ice dams occur in areas where snowfall and cold temperatures are common and pose a special problem because they prevent melted water from running off the roof. They can even cause leaks inside the home, resulting in drywall damage. Heat buildup. Today’s homes are more airtight than ever before. Heat can build up in the attic and eventually seep into the living spaces of the home. That can make appliances work harder and increase the utility bills. Meanwhile, the heat buildup can lead to premature shingle deterioration. Moisture buildup. The average family of four generates two to four gallons of water vapor a day through activities such as cooking, cleaning, showering, laundry, and breathing. Some of this water vapor rises into your attic. Ventilation helps remove it before it causes problems such as wood rot, wet insulation, mold and mildew. Protecting your investment. Most shingle manufacturers require proper attic ventilation as a condition of the shingle warranty’s validity. Proper attic ventilation will help protect your new roof investment. Why did my 25-year roof fail at 8 years? The new modern asphalt shingle now has a fiberglass base and needs to be installed in the updated, modern way. If fiberglass shingles are installed correctly this product will and does provide a Limited Lifetime Warranty. Ben’s Roofing's most frequently asked question is, “Why did my 25-year roof fail at 8 years?” The roofing industry blames the manufacturer instead of rightly blaming the installer. The roofing industry must stay educated and upgrade their installation practices to keep up with modern technology. Whole roof underlayment and adequate ventilation plays a very important part in the life of your fiberglass shingle roof. Home inspectors need to tell prospective buyers and sellers their home has a quality roof that will last because of the installation techniques. Again, full underlayment and upgraded ventilation installed by a certified ventilation expert regardless of what synthetic roof you choose is the only way your roof will have a Manufacturer’s Warranty and last for years to come. Most roofing companies cannot offer a Manufacturer’s Warranty. Ben’s Roofing will! We are a local roofing company living with you in your community; we are your friends and neighbours and are here to provide answers to your roofing questions. Don’t wait until your roof is installed to find out it does not qualify for a Manufacturer’s Warranty. Can you re-roof a home in the winter? A lot of people ask whether it’s OK to re-roof their home in the winter. The answer really comes down to a combination of factors which may or may not permit the homeowner to wait until warmer weather. One of the most important issues to clear up first is whether asphalt shingles themselves can actually be installed in the winter. It’s important to note that asphalt shingles actually CAN be installed in the winter. In most cases they aren’t too frozen or brittle. There are actually some shingles in extreme northern climates such as Canada and Alaska that are made for colder weather such as -20°C. Remember also that asphalt shingles are made to protect your home in winter during colder weather so it stands to reason that the risk for installing them in cold weather should be low. There are legitimate concerns about the seal strip and whether the shingles will seal in the cold. Remember, it’s almost always warmer on the roof to begin with. Underneath the roof deck there is usually warm air moving around in the attic and on the roof’s surface the sun is warming up the roofing materials during daylight. It can be as much as 10-20° warmer on the roof, and all that is needed is a warm winter day for the shingles to adhere to the seal strip. If there is no such warm winter day in sight but high winds or extreme weather are anticipated, the roofing contractor will place quarter-sized dabs of roof cement underneath the corners of the shingle tabs while installing them, to ensure wind doesn’t get underneath them while waiting for them to seal. With some heavier laminated dimensional shingles, securing their tabs with cement isn’t even necessary as they’ll lay fine until they have the opportunity to seal. Considering the asphalt shingle’s ability to seal itself, the real question isn’t whether a home can be re-roofed in the winter, but should YOUR home be re-roofed in the winter? This question of course is best answered after a thorough inspection of your shingles, flashings, roof deck and other roof components – even those that may not show signs of weather penetration. The best inspection is performed by a trusted, experienced roofing contractor. If there are urgent issues such as leaks or penetration of snow, ice, animals, vegetation, falling off and broken shingles or other common problems, it may be time to carve out one or two days of favourable weather and get busy on the new roof. Even if there’s no urgency, winter may be a good time to roof your home. Contractors actually enjoy cooler days and may be anxious to get busy on your project. Your roofing material dealer might also be running an off-season special on your shingles. Should I remove snow from my roof and what about ice dams? While most people rarely give any attention to the snow on their roof (they just think it will melt off and be gone) this snow buildup on your roof can cause significant problems both from the physical weight of the snow buildup and water damage from melting snow. The weight of the snow on a roof also varies by area, and most homes are designed to handle a hefty snow load. But in severe winters, you may want to use a roof rake to eliminate the sheer weight of the snow on your roof. A cubic foot of snow can weigh anywhere from seven pounds (for snow that is new and dry) to 30 pounds for old, compacted snow. Plus, any freezing rain falling on accumulated snow will add more weight. An ice dam is a buildup of ice on a roof that can force water under the shingles and into your home. Heat from the interior of the home warms the underside of the roof causing accumulated snow and ice to melt. 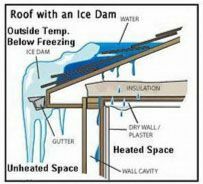 When the water reaches the cold edges of the roof outside your interior warm walls (above your soffit) it re-freezes causing the ice dam. Once the ice dam is created, any additional water is forced up and under the roof covering. The building code requires that you protect yourself from ice dams using appropriate underlayment, but limit this requirement to roofs that have 8/12° slopes and below. The picture above clearly shows that no roof is immune from ice dams. Ben’s Roofing and all shingle manufacturers recommend that you install appropriate leak barriers (ice and watershield) at the eaves and critical areas of your home to protect yourself against ice dams. What are the advantages of metal over other types of roofing? Prefinished metal roofing is available in a variety of attractive colours applied with long-lasting coatings which resist the growth of mildew, moss and fungus. Unlike asphalt shingles, metal roofing will not crack, curl, chip, break, rot, peel or perforate under regular conditions. While metal panels are lightweight you can rest assured they are strong enough to hold up against severe weather—snow easily slides off! What's more, metal roofing is proven to last longer, conserve energy and require less maintenance. Can I install metal panels directly over my old, worn out shingles? Yes—since metal weighs 1/3 as much as shingles it is often possible to attach metal panels without removing them. This represents a significant cost savings and eliminates the problem of how to dispose of the existing shingles. No—rainfall on a metal roof isn't any louder than the patter you're used to with your existing roof. This is because metal roof panels are installed over felt paper and plywood on the outside with noise reducing insulation and your drywall ceiling on the inside. Thanks to their corrosion resistant substrates and durable finishes, a metal roofing system is likely the last roof you will ever put over your home, garage, barn or shed. In fact, most metal roofs have life expectancies that exceed 50 years. What does all of this represent? Serious cost savings, better performance and minimal maintenance. Will a metal roof make my house or building more susceptible to a lightning strike? No—a metal roof will not increase the likelihood your property is hit by lightning. In fact, lightning tends to strike the highest structure in a given area regardless of what it is composed of. Plus, metal is a non-combustible material and that makes it safer in the event your property was hit with lightning.